Was that a policy that was in place for “years” or “minutes”? 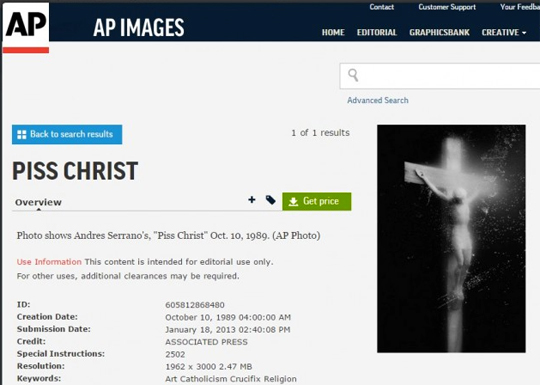 Gawker reported that AP was willing to sell images of the infamous “Piss Christ” up until …. yesterday afternoon. Ask yourself this question: Why was a piece of “art” that portrayed Jesus submerged in a jar of urine okay for The Associated Press to sell, but an uncensored picture from Charlie Hebdo is not? Perhaps it has something to do with the fact that newspaper editors are not afraid Catholics will behead them when angered. Free speech has taken a beating in the last few months. First there was Sony Pictures Entertainment, which had to be dragged kicking and screaming to do the right thing after it was hacked by the “Guardians of Peace,” and now major news outlets are giving credence to idea that content should be censored if it is deemed blasphemous. Any western newspaper that goes out of its way not to offend the kind of people who would burst into an office shouting “Allahu Akbar!” while armed to the teeth is a newspaper that is not living up to its responsibility to defend free speech. If an individual works at a major newspaper and his mentality is, “Hey, I’m just the guy who manages the Twitter account — I didn’t sign up for defending free speech,” then that is not an individual who should be employed at said major newspaper. Lace up your boots and put on your capes, free speech superheroes. You have work to do. It’s embarrassing that such a thing even needs to be said. Next Entry Obama on community college: ‘Free’ stuff! ‘Free’ stuff! Get your ice-cold ‘free’ stuff! Once again it shows that it is open season on Christianity. The normal selective outrage and persecution as usual from the typical media outlets continue. John 3:13- Do not be surprised, brothers, that the world hates you. I do find it interesting how people react to Christians who are upset and how they react to angry Muslims. Oh, Amen to this post! I suppose we can’t entirely blame the media for being such hypocritical wimps, they have leadership unwilling to take a stand and actually back them up. Our own leaders wouldn’t even state that this attack had anything to do with Islam! Instead of confronting the truth, we’re just force fed platitudes about tolerance and the religion of peace. It is an incredibly strange experience to watch individuals attempt the slow-motion sacrifice of Western Civilization at the alter of political correctness. Thanks for the comment, insanitybytes22. As always, I am grateful that you took the time to stop by and add to the discussion. Funny I checked before as well, completely silent on the matter. Correct me if I’m wrong, but isn’t Ms. Wilson an American? What’s up with “your” media? That is rather odd, self separation I guess since it does seem they think they are above every one else. 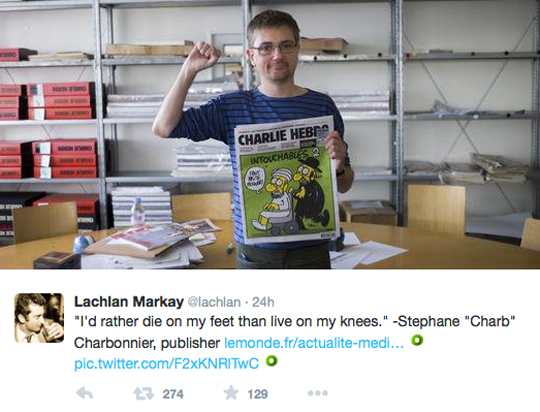 a few years ago a cartoonist at Charlie Hebdo was fired for an anti-semetic cartoon. I’m sure all the free speech supporters here will take issue with that, right? Do you have a problem understanding the difference between a private business choosing which stories/images to run according to its editors’ discretion — in addition to who it employs — and that very same private business being threatened with physical violence and death by religious fanatics if it doesn’t agree to their demands? The only thing that you should be sure about is that you are, indeed, a troll of the highest order. The cartoon didn’t create a commotion until several days later, when a journalist at the weekly Le Nouvel Observateur called it “anti-Semitic” on July 8. The families of Jean Sarkozy and his fiancée said they would sue the magazine; Charlie Hebdo’s editor, Philippe Val, who also republished the controversial Danish Muhammad cartoons in 2006, then asked Siné to apologize. Siné said he would rather castrate himself than apologize, and Val fired him. The cartoonist was tried for a hate crime. My reading of the article was that the Sarkozy family threatened to sue, but it doesn’t say the cartoonist was actually tried in court. It does say that he was fired when he wouldn’t apologize (i.e., say some sort of ridiculous platitude to make it all go away so the Jew-bashing/Muslim-bashing/Christian-bashing could continue a few weeks later), and sued Charlie Hebdo for defamation. Regardless, you’re asking me to express shock and outrage that “hate crimes” — a stupid invention by politically correct liberals — would be employed and abused by liberals, pseudo-socialists, and socialists in France. That’s weird. Yes, we should do away with hate crimes. I care about dealing with facts instead of trying to read minds. Murder is murder. Assault is assault. Robbery is robbery. Legally, it doesn’t really matter what’s swirling around in someone’s head when they commit a crime; it just matters that they be held accountable for the crime. You’re so weirdly desperate to find something to argue with that you’re using a post on a clear threat to free speech — Islamic terrorists slaughtering newspaper editors in the workplace — to try and get me to talk about a bunch of liberals in positions of power who went after a liberal publication over liberal laws that conflict with the right to the freedom of expression. Classic. Yes, Lizard19, I wish France were more conservative. That would be a good thing. 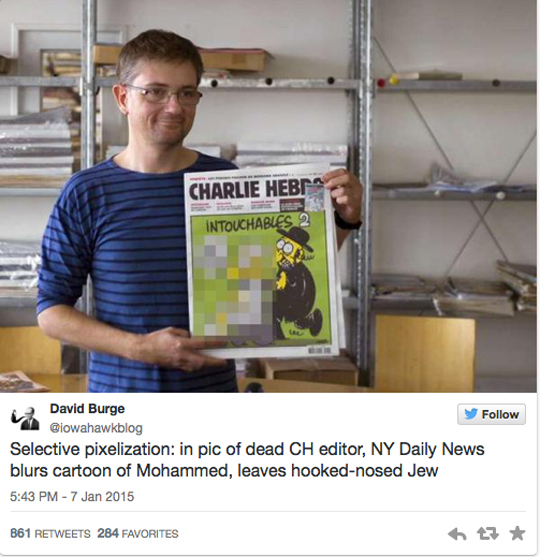 A supposedly anti-Semitic cartoon is a … hate crime?? Only in Europe … and in the minds of idiotic liberals. Nevertheless, two things: 1) Doug is correct in that a private business can do as it wishes when it comes to business decisions. Lizard19 coming in here and bringing up “hate crimes” with his typical sarcastic remarks reminds me of that scene in Indiana Jones and the Last Crusade where only “the penitent man shall pass.” Lizard19 wasn’t too humble and he just ran into two buzz saws. This could have happened to Salman Rushdie. This could have happened to Trey Parker and Matt Stone. This almost happened to the Jyllands-Posten. I was in Pakistan over the holidays. I had a great time, and it was definitely nice to go back after four years, but it struck me how much more Islamic the country has become. There are a lot more religious ads, religious television shows, and people wearing burqa and niqab. Perhaps the biggest shock came at the airport. You cannot bring in anything deemed “anti-Islamic”. You’re not allowed to browse websites like TRoP, Creeping Sharia, or WikiIslam either. And Pakistan has some of the worst blasphemy laws, too! 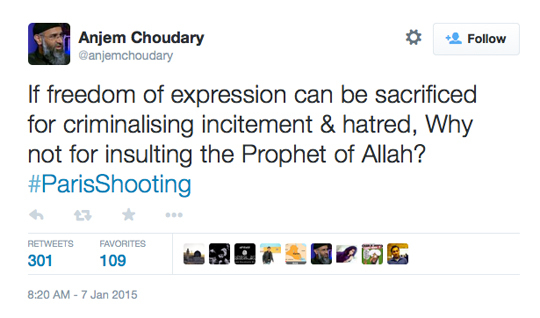 It’s as if no matter the context, or the tone, you simply cannot criticize Islam. Why does this have to happen to my country?